Located at the foot of Tianshou Mountain in Changping District, Beijing, the 13 Ming Tombs are the cemeteries of the 13 Ming emperors, 23 empresses, and many imperial concubines, crown princes and princesses after the Ming Dynasty moved its capital city to Beijing. 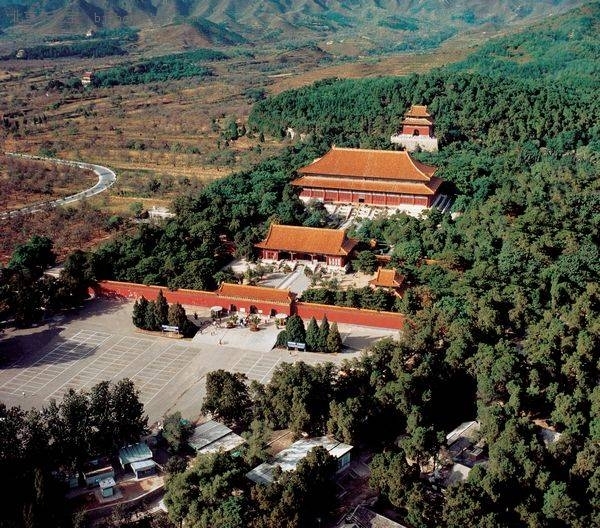 Ming Tombs covers 40 square kilometers in the Changping District. The unique ensemble of cultural landscapes is evidence to a cultural and architectural tradition that surpassed the Ming Dynasty and had an everlasting impact in Chinese history. It boasts high historic and cultural values due to its grand architecture, complete system and long history. The thirteen emperor's mausoleums are similar in their architectural style and overall arrangement, only differing in size and complexity. Ming Tombs, as a unified whole, and each represents a separate mausoleum units. Each tomb was built in a Piedmont. Each has a forecourt where memorial ceremonies and sacrifices were held and a tomb mound at the back. Every tomb is as little as half a kilometer between each other, up to eight kilometers. Under the guidance of the theory of traditional Chinese Feng Shui, from site selection to planning and design, the design of the Ming Tombs was much focused on the harmony of mausoleums and water, plants and the nature. The Ming Tombs, as an outstanding representative of ancient Chinese Mausoleum, shows the rich connotation of Chinese traditional culture. On July 2003, it was inscribed on the UNESCO's World Heritage List. They were listed along with other tombs under the "Imperial Tombs of the Ming and Qing Dynasties" designation. Currently, only the Sacred Way, Changling Tomb), Dingling Tomb and Zhaoling Tomb are accessible to the public, and the rest parts of the 13 Ming Tombs are not available to visit. Small compact car 900 8hrs Gas,Tolls,Parking fee. 5 seats Mid Size Car 950 8hrs Gas.Tolls,Parking fee. English speaking driver hold a sign with your name,waiting for you in the hotel lobby. Usually,We start trip at 07:00~07:30am from your hotel，avoiding traffic and less tourist on the Wall,and come back to city around 16:00~16:30pm.It is only our suggestion，you decide the departure time. Beijing downtown→mutianyu wall：75km,usually 1.5hrs drive ,depending traffic condition. Mutianyu Great Wall hiking :2~3hours.